Some people drink heavily at holiday gatherings to ease the friction they feel. The anxiety created by a house full of annoying people who are just, you know, in your face. But that wasn’t my problem. My problem was that my family didn’t understand my problem. And that was kind of okay, because holidays are a time when everyone is drinking. If I was careful, I didn’t stand out. Like everyone else coming to my parents’ house, the moment I got in the door I was greeted by family members who encouraged me to take off my coat and have a drink. That’s normal, right? The problem was, I couldn’t have just one drink. Or even three. At those gatherings full of holiday cheer, as I mentioned before, the good news was that I didn’t have to hide my drinking as much as usual. I didn’t stand out so much - so I thought! - because we were all “celebrating”. But in truth, in those days, I didn’t need a celebration to drink. I drank when things were good. I drank when things were bad. Once the booze hit my lips, it was all I could think about; the rest was background noise. Yes, I could hear my sister talking to me at the dinner table about her son, but in the back of my head, I was wondering how much alcohol was left in the kitchen. When can I get up for a refill? Will there be enough left? Will someone notice how much I am drinking? Those thoughts swirled around in my head like radio static, drowning out everything else. By the end of the night, I’d had plenty to drink and everyone was saying goodbyes. I thought I’d stayed under the radar. But that night, my uncle James, who is sober, came to me and asked me not to drive home. “You’re slurring your words a bit”, he said. Ugh! AlI could think about was, now my family knows I am drunk. My anxiety went through the roof and my mind raced to come up with explanations - no matter how bizarre - for why I’d had so much to drink. I started to get really wound up and wanted to escape, and quickly. But then, the most wonderful thing happened. First, James calmed me down and then helped me get settled in one of the bedrooms upstairs. Nobody seemed to notice, so I just passed out. The next day, after I’d slept off most of the grogginess, he sat me down and told me his story. It seemed amazing at the time, but James understood what it felt like to sit at the table and constantly worry about how much alcohol was left in the house. He knew about the “radio static” chatter in my head - that never stopped anymore, even with a drink. He told me I never had to feel that way again, if I didn’t want to. To be honest, that seemed like a fairy tale. But he told me his story of getting sober. He shared with me how he reached out for help and other sober people taught him what he needed to do to change his life. He explained how he makes it through the holidays without a drink. He told me he’d support me if I wanted to make that change. And that very day, I got started on recovery. My sobriety date is November 25, 2016. 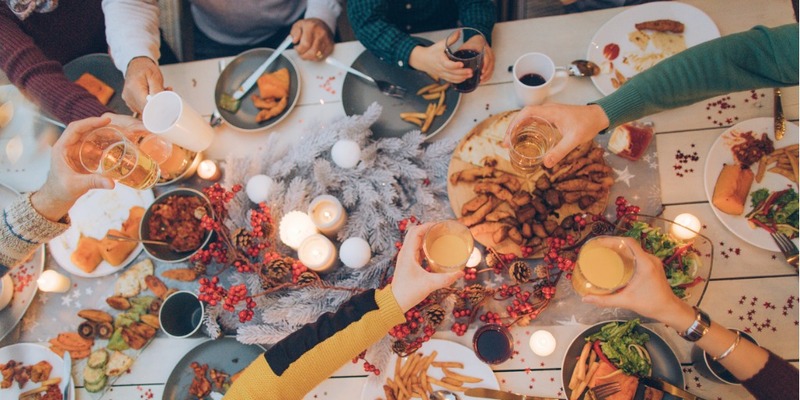 That year, I was extra thankful: it was my first sober Thanksgiving in over 15 years. And the day after, I celebrated one year of sobriety at a meeting with my uncle. That really does sound like a fairy tale. But it’s not. When I got help for my problem, talked to others in recovery, and remembered to focus on being connected to the people, not the alcohol, I was able to change my life.